I am keeping it pretty simple too – it a busy time of year. 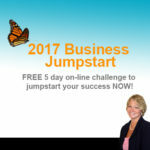 Here are 3 tips to help you make MORE money in your business in 2017 with just working where you are now – and I do not mean more sales! Are you sure your pricing your products and services correctly? When’s the last time you raised your prices? How often you you give discounts? A seemingly simple 10% discount usually means you will have to sell 25% more to make up the difference- crazy right? Every action you take in your business mus bean ROI – a return on investment. INvesting money and spend money are not the same. Think about how your money comes and goes, and when it goes, make sure it is a good investment. I find the # cause frustrated business owners have is that they are not really sure where the money goes and more importantly WHY it goes. That is more than enough to get you thinking for this week! Remember, more sales doe not always mean more money. If you increase your sales without having a handle on your money, you may actually dig yourself a deeper hole. Let’s make sure that doesn’t happen to you.